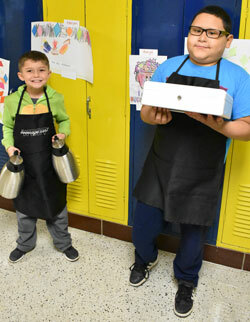 Third-graders Cameron Blouw and Javier Garcia made their way down the hall of West Godwin Elementary last Thursday, pushing a cart stocked with carafes of coffee, hot water for tea, and a variety of cold, fizzy beverages. 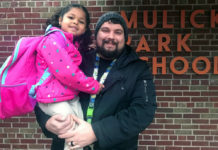 They stopped outside a classroom, and Javier entered and approached the teacher. 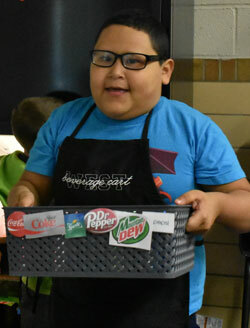 “Would you like to purchase a beverage from the beverage cart?” he asked. The beverage cart is a new service at West Godwin, making its first run on Oct.16. 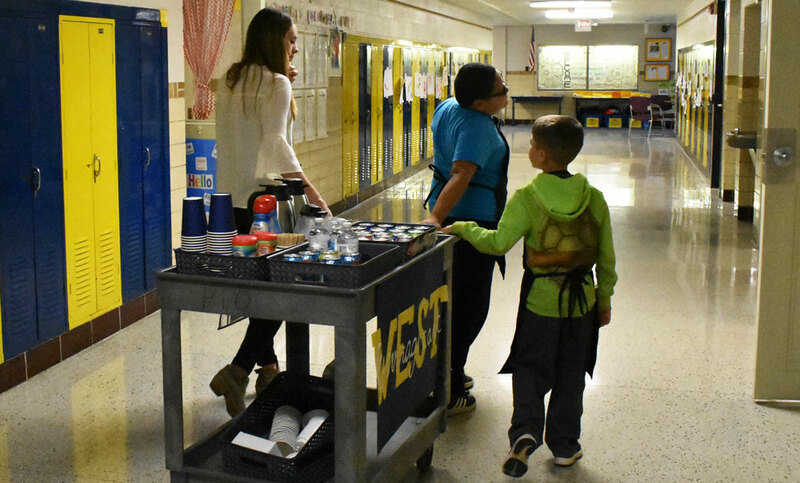 It seems like a simple enough undertaking — students selling drinks to staff every Tuesday and Thursday morning — but for the four students who operate the cart, it’s providing valuable lessons that will transfer to other avenues in life, says Jacqueline Pnazek, resource room teacher at West Godwin. 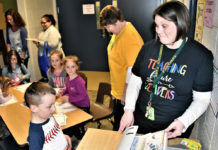 Pnazek’s resource room is a classroom for students in special education. 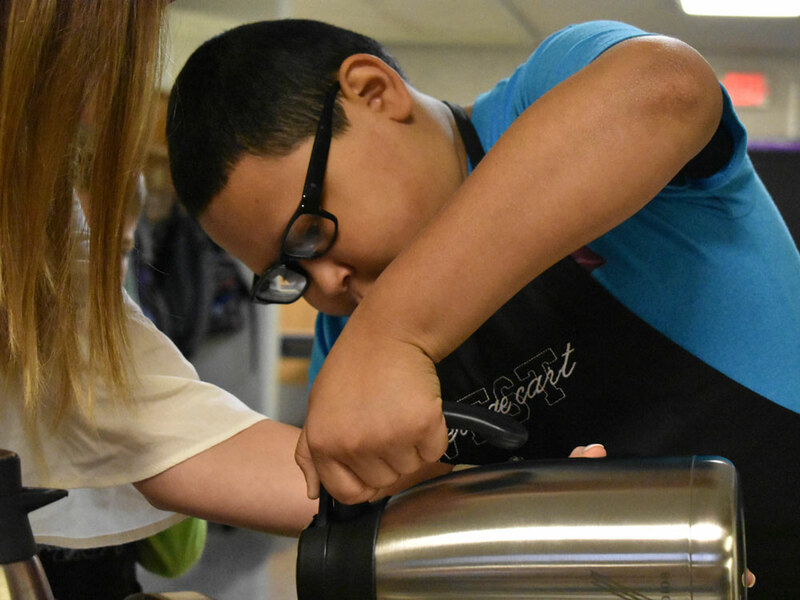 There, students receive targeted instruction based on their current needs. 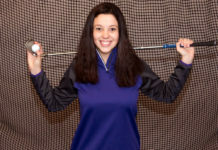 The beverage cart was Pnazek’s brainchild. 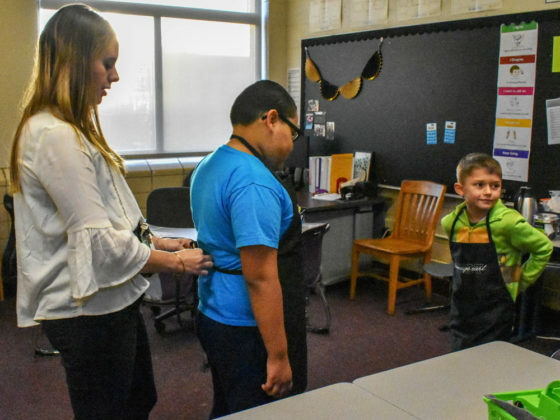 She created it, her mother embroidered the aprons for it, and she accompanies the students who operate it. 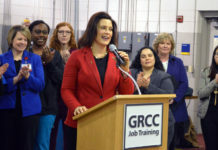 The idea, she said, is to provide meaningful opportunities for students to work on social skills, life skills and job skills. 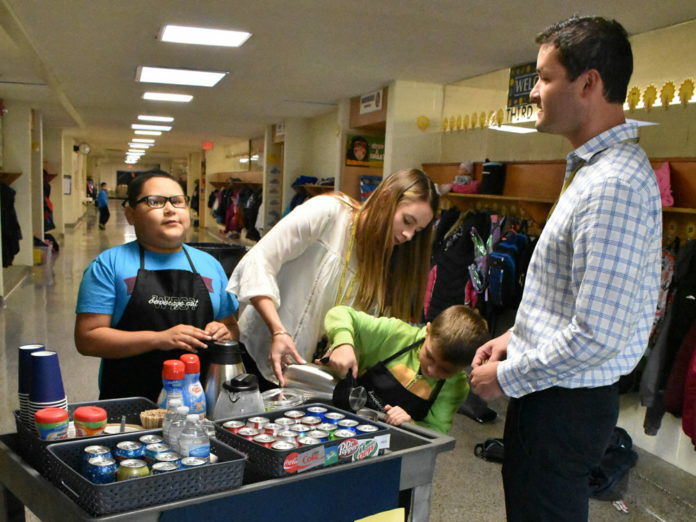 Talking with staff and teachers and offering them beverages, then serving the beverages and handling the payment hits on all of these skills. 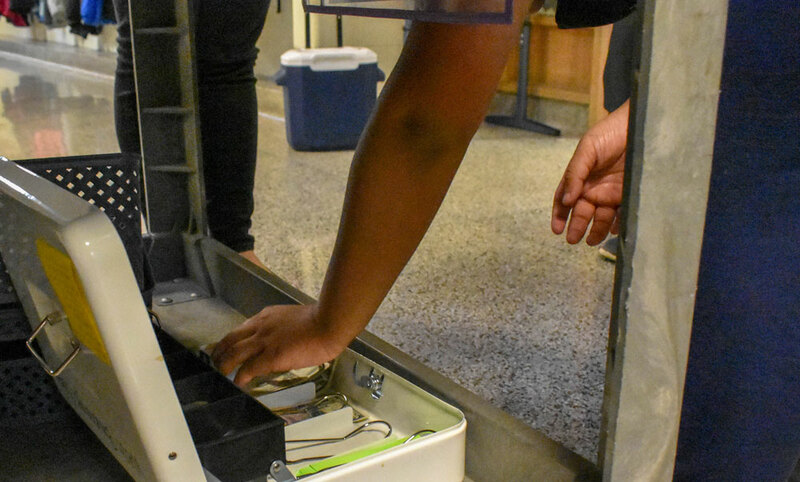 It’s not a real moneymaker — the money earned restocks the cart — but that’s not the point. 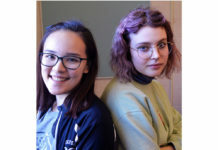 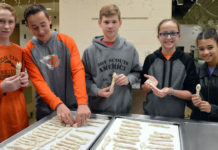 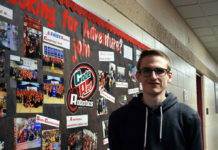 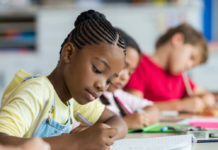 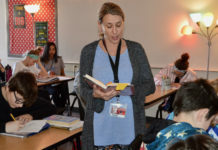 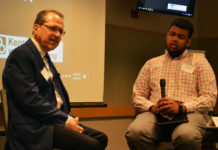 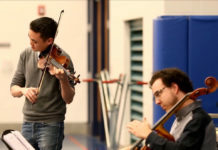 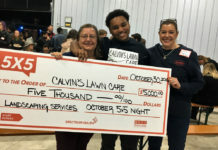 “Being able to make change and handle money is such a life skill, and some of the students need that hands-on, real-life experience in order to make the connection and really learn,” said Pnazek. 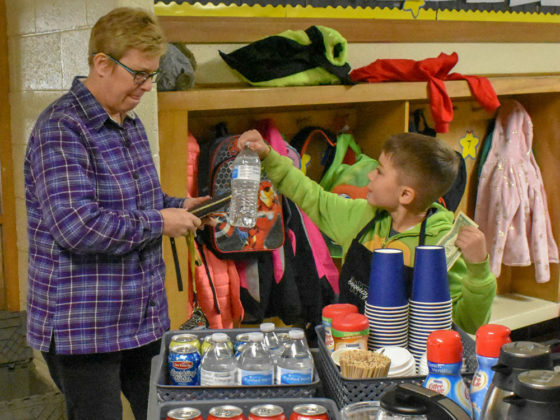 “Wait until she’s off the phone,” Pnazek told Cam, who was eager to offer a beverage to school secretary Kristi Bast last week. The students who work the beverage cart are in speech and language therapy, so operating the cart is a good exercise, said Pnazek, in using complete sentences and responding appropriately to the adults they are serving. Pnazek said careers in the retail and service industries are appropriate future jobs for many of her students. 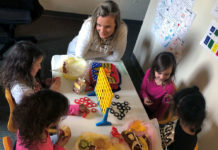 She wants them to begin loving it from a young age so they are excited about it and have some experience to help them should they consider such careers. 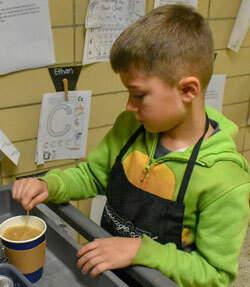 Third-grader DeAnvia George and first-grader Colston Minnema operate the cart in addition to Cam and Javier. 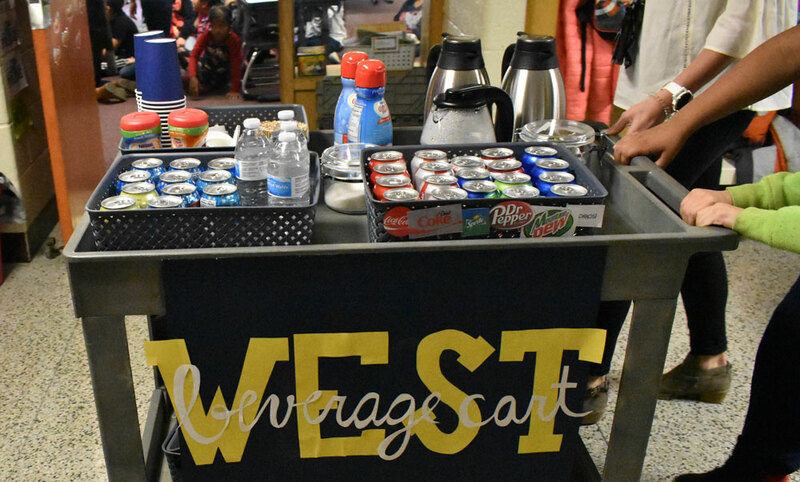 DeAnvia said operating the beverage cart is fun because she likes to see some of her favorite teachers from past years.